For pick up or delivery. Delivery within 5 miles with a $10.00 Minimum. Delivery to Eaton's Neck, Kings Park, Huntington, Huntington Station, Huntington Bay & Green Lawn. All pies are 8 slices unless otherwise specified. Add from our selection of toppings for add'l charge. 9 slices. Please allow 25 - 30 minutes cooking time for all pan pizza. It's worth the wait. 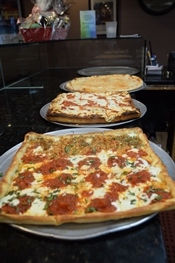 Thin crust hand tossed. Add from our selection of toppings for add'l charge. Panko breaded chicken cutlets, roasted red peppers, fresh mozzarella, fresh basil & balsamic glaze. Sauteed broccoli rabe & crumbled sausage atop our Neopolitan pizza. Specialty, whole wheat & gluten free pasta available for add'l charge. Add chicken, shrimp or steak for add'l charge.